No, there was no Launchpad for your apps on the original Apple II, the legendary home computer developed by the late, great Steve Jobs and his partner, Apple co-founder and engineering whiz Steve Wozniak. Instead, you had to load your apps—er, your programs—from a 5.25-inch floppy disk (yes, they were literally floppy) or a cassette tape. Or, if you were feeling especially creative, there was another alternative: writing a program from scratch, in a programming language called Integer BASIC. Short for “Beginner’s All-purpose Symbolic Instruction Code,” BASIC was a programming language so simple that even a 10-year-old, math-challenged kid like me (back in 1979, anyway) could parse it. Developed by Wozniak himself, Integer BASIC was a variation of BASIC that was fused into the ROM (read-only memory) hidden in the Apple II’s soothing, molded-plastic shell. Once you booted up the Apple II (there was no Apple logo on the initial loading screen, by the way; instead, the text “APPLE ][” would appear centered at the top of the screen), you’d get a square-shaped cursor at the bottom of the display that blinked next to a caret (the “>” symbol). From there, you could type commands, like “LOAD” (to load a program into memory) or “RUN” (to run a program) … or you could just starting programming. A BASIC program consisted of lines of numbered code, and to start writing a program, you’d just type “NEW” to clear the Apple II’s memory, then type a number (you’d generally start with “10,” to give yourself a little room in case you wanted to add an earlier line of code), and then enter the first line of your program. Yep, pretty (and appropriately enough) basic—a program that just printed my name over and over, in an endless loop. Primitive stuff, yes … but amazing, too. For the first time, regular people like me and my dad were writing computer programs, on our own home computers—at a time when the most complicated gadget in the average American household was probably the TV set. 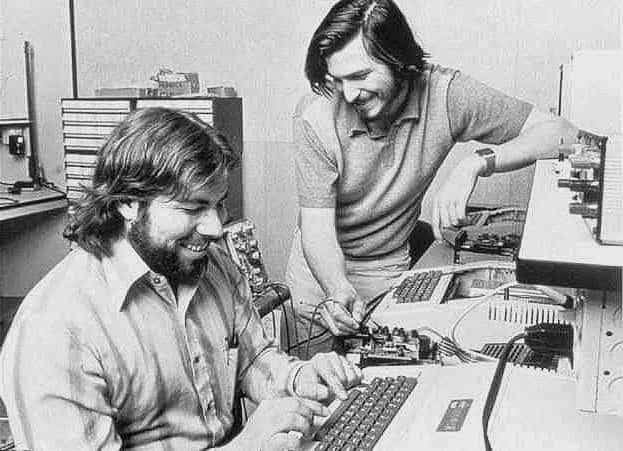 Now, just to be clear, there wouldn’t have been an Apple II without the ingenuity of Steve Wozniak’s elegant, efficient engineering. But it was Steve Jobs’ marketing savvy, his unerring (well, almost always unerring) sense of what people wanted, and his passion for great, sometimes even delightful products (indeed, “delight” is the word that springs to mind when it comes to Jobs’ masterful product unveilings) that turned the Apple II from a marvel of engineering into a common sight on kitchen tables and in home offices. And that was the real breakthrough. Rest in peace, Steve. We’re going to miss you.